By Skyhawk to Florida – Day 4 – On the way to Sun’n Fun! – EHFC Members Talking! The weather in western Colorado (that’s western Colorado as in “it’s always sunny in Fruita”) has been utterly wretched for the last three days. We’ve had snow, and rain, and this morning when I woke up you couldn’t see across the street for the fog. It took until noon before the clouds lifted enough that we could get out of Mack Mesa. Greetings from Santa Fe, New Mexico. As I’d said, it took until noon for the clouds to lift, but they didn’t lift anywhere near enough to allow crossing the Rockies at any of the available passes. The clouds were at or below mountain level both north and south of the valley that Mack’s in, and the highest ceilings along the original route were well below the passes. So, we replanned the trip to head west to Utah, then turn left and follow the valleys down to Santa Fe. As it turns out, it’s entirely possible to do that route at no higher than 7,800 feet. Once the ceilings along the way got higher than that, we were off. 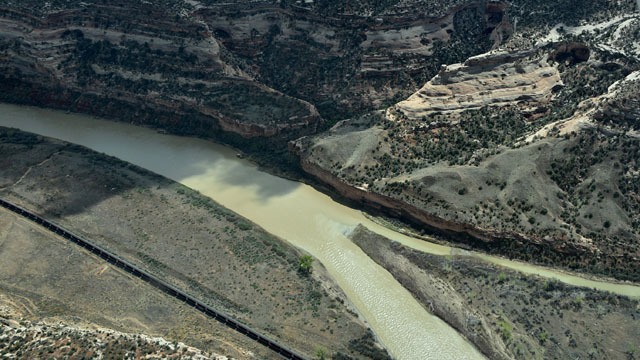 The sun broke out as we neared the Utah state line, following the Colorado River as it wound its way. 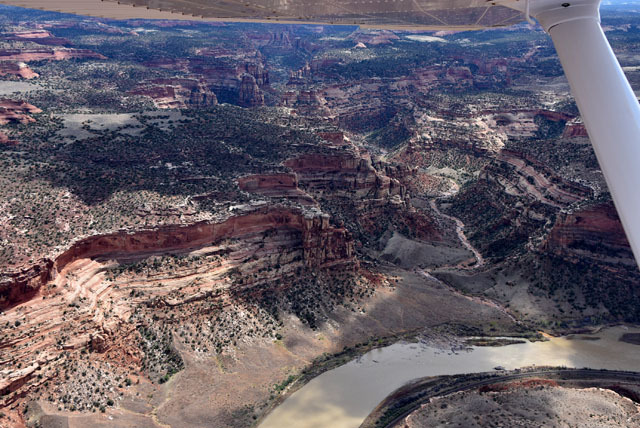 The valley opens up as you enter Utah, and the ceiling lifted and became much more broken, too. 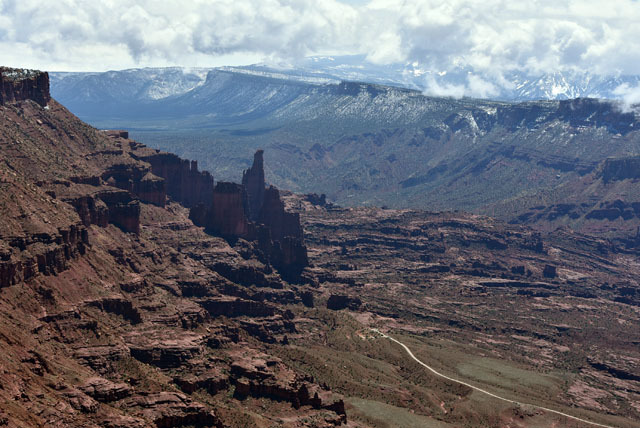 This is Fisher’s Towers, a well-known photography spot not far from Moab. From just south of Moab, we turned southeasterly toward Dove Creek VOR (DVC), which sits in a corner of a farmer’s field. From Dove Creek VOR, the route crosses Cortez (CEZ) and Rattlesnake (RSK) VORs. 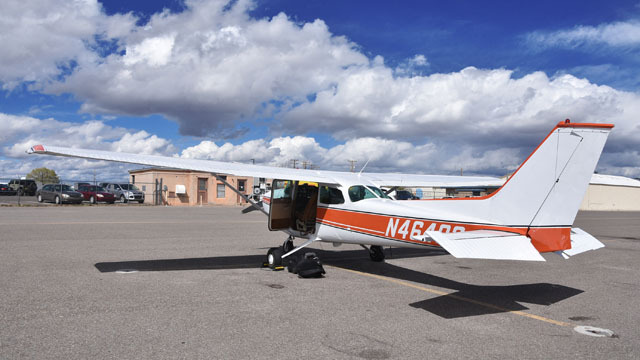 Rattlesnake is east of Farmington Four Corners Regional Aiport (KFMN), and was our first waypoint in New Mexico. By this time we were indicating between 125 and 135 knots groundspeed – after fighting headwinds all the way out it was so great to have a significant tailwind for a change. By the time we got to Cortez we were able to climb up to 8,300 feet, which put us comfortably above anything nearby for the rest of the trip. The weather report (METAR) at Santa Fe had changed to a 4,100 foot ceiling, which meant not only that they were full VFR, but the clouds were over 10,000 feet (KSAF is at 6,400 feet). We could be sure that not only did we have lots of air below us, we were also comfortably clear of clouds, too. I should note that this was one of those times I was glad I had the Garmin GDL-39 ADS-B receiver – getting real-time weather uploaded as long as you’re in range of an ADS-B ground station is a real plus. 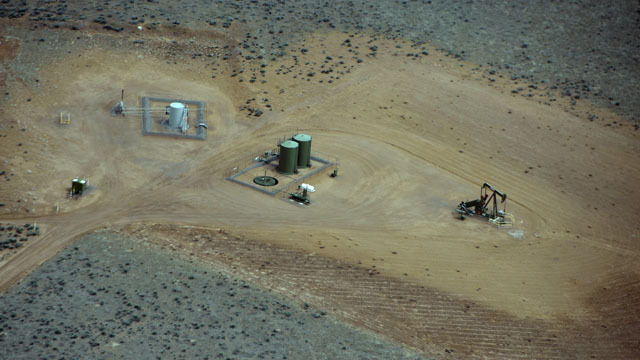 There were a lot of oil and gas wells in New Mexico. This one was out in the middle of nowhere, with nothing at all for miles but the rocker pump and storage tanks. Presumably someone must come along from time to time and empty the tanks – it must be quite a drive to do so. 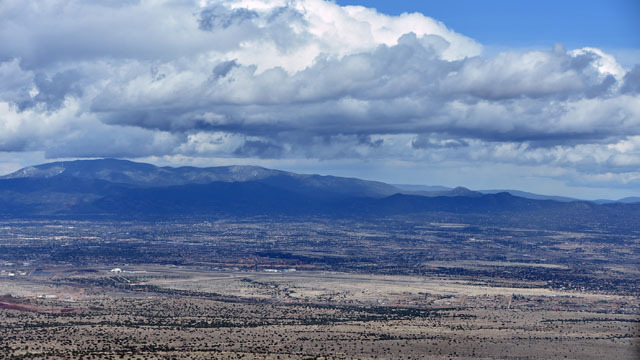 Santa Fe is effectively in the next valley over from the one we’d been following – with the Sandia Mountains in the way, peaks at 9,000 feet and up. 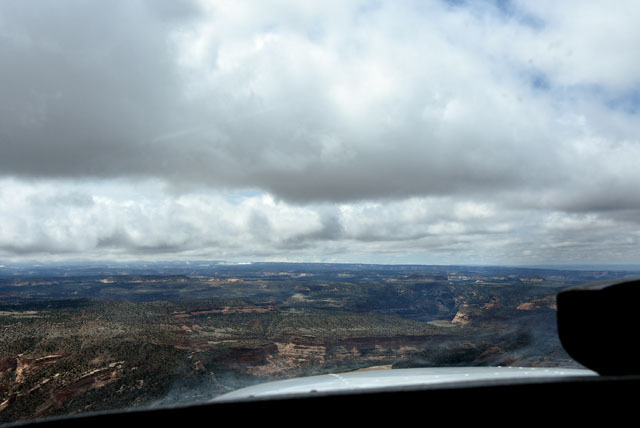 You have to continue southeast until you’re nearly due west of Santa Fe before you can turn left and aim for the airport (PEDRA interection, if you’re following along on a sectional chart). We did so, and as soon as we did we started hearing Santa Fe Tower. 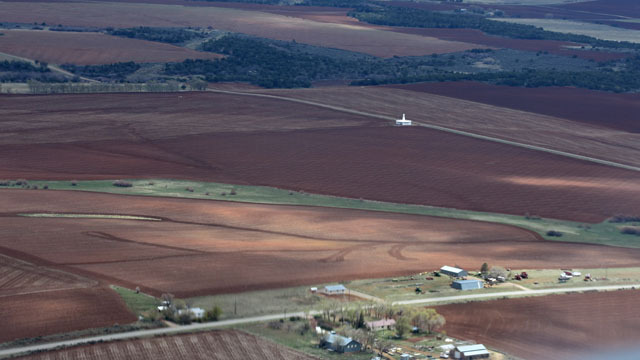 We called in about 25 miles west of the field, and were told to expect runway 28, as the winds were varying between 270 and 290 degrees at 17 knots, gusting 24 knots. Before long we cleared the last ridge, and Santa Fe was straight ahead. We were cleared to land while we were on downwind, number two behind another Skyhawk. They weren’t kidding about the gusts – about 200 feet up, 493 sort of bounced upward and rightward. That got my attention, believe me. Nevertheless, I think my landing was quite creditable, if I do say so myself. At least, Jerry didn’t scream and grab the yoke or anything… and we were down and parked at Landmark. 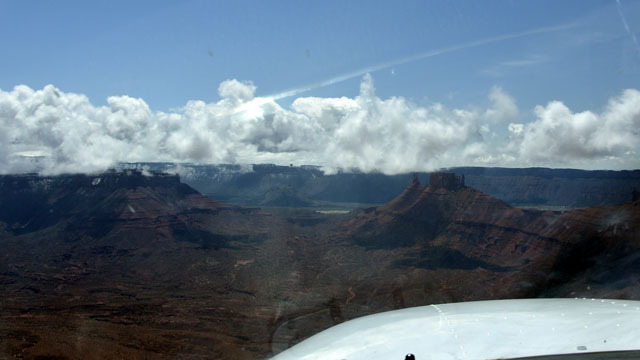 Pingback: By Skyhawk to Florida – Day 3 – Cheyenne to Mack Mesa | EHFC Members Talking! The incredible N46493…once again headed in the wrong direction to make progress (but the scenery is amazing!) 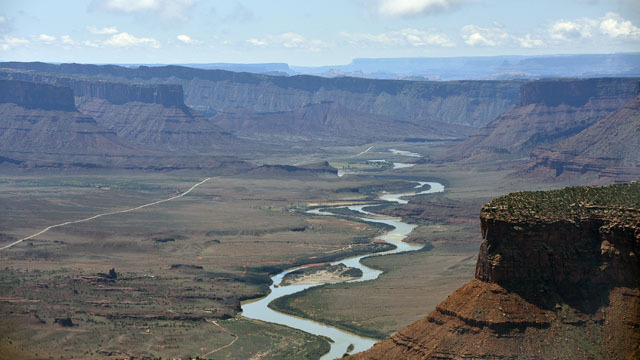 Thanks for the wonderful pictures…I love Moab. Hopefully you guys get to Sun N Fun (after circumnavigating the West) sometime soon.